First things first—ever hear the phrase, “don’t throw the baby out with the bathwater?” That’s good advice. Definitely don’t be throwing babies, with or without water. One of the nice things about babies is that they don’t necessarily need a bath every day. Their skin is very sensitive and if you do it too often, you might actually dry their skin too much or cause a rash. When you first start bathing your child, a sponge bath is usually enough. You can place your baby in an infant bath or other container to catch the water and gentle rinse their bodies. You can even place the baby on a comfortable towel or blanket. Use a mild soap designed for babies (never regular soap) and start with the face and go from there. This keeps the cloth or sponge cleanest when cleaning eyes, nose and mouth. You can do this at least until the umbilical chord falls off. 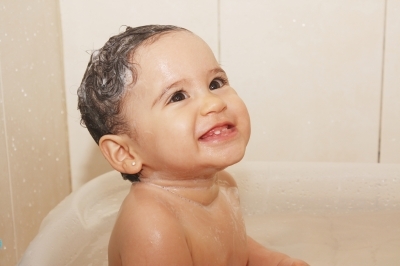 When using baby baths after that time, remember that you do not need much water. Make sure the water is warm, but not too hot and do not leave the child too long in the bath as the water will quickly cool and can cause the baby discomfort. The most important thing about bath time is to never leave your child unattended while bathing. Take it from the man whose brother nearly drowned on his first birthday. Luckily that story has a happy ending and he’s alive and well today, but it could have easily ended tragically. Bath time can be a great time to bond with your baby and to soothe them. Enjoy it!